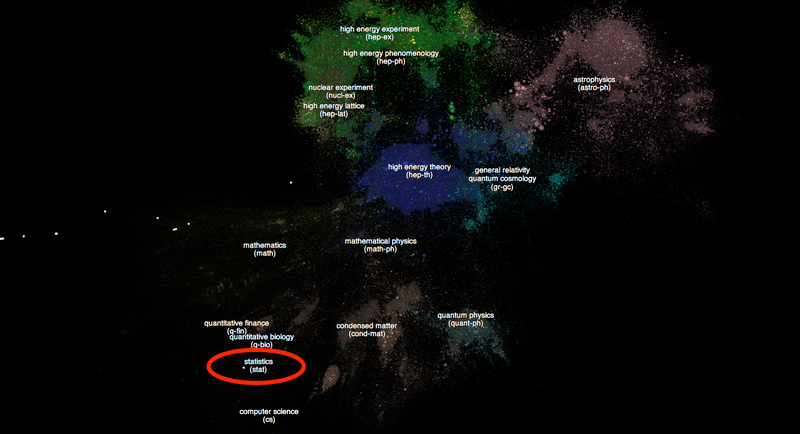 These clouds of points represent 866,543 papers from the arXiv, an open access scientific publishing site first created in 19911. This map of the arXiv universe is maintained by Damien George and Rob Knegjens over at paperscape. It's hot off the presses, having only been released this month. I found out about it from Sean Carroll's blog. I'm happy3 to have it situated there. I'm an aspiring statistician, of the weakest sort: in the tool using, not the tool making, sense. Henri is a number theorist at McGill University, and according to this page, "[o]ne of the world's leading number theorists, working on Hilbert's 12th problem." One of his inventions is Darmon points, something useful enough to have symposiums about. Since my interests don't frequently stray into number theory, I don't imagine either of us has to worry about name pollution. (Especially Henri.) I'll have to start working on my own version of Darmon *.